I was feeling as if I was on the verge of being blue today. K is working an astronomical amount of hours lately, and J isn't here to keep me entertained with his quirky sense of humor. So, I went shopping at my favorite store, the Beehive. I racked up! 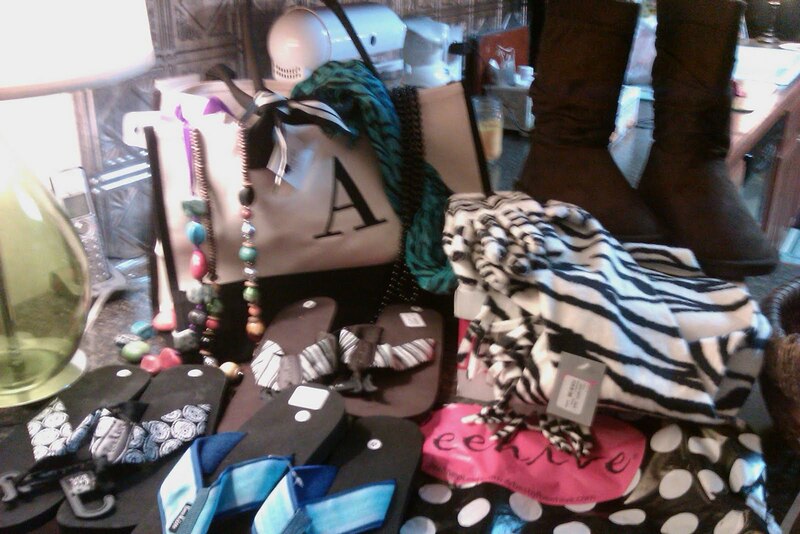 I'm including a picture of my loot, which includes a fantabulous pair of boots, a monogrammed bag, a zebra print scarf/gloves set, three necklaces, a lovely turquoise and black scarf, and three pair of flip-flops. Yes, it is cold outside, but flip-flops are year-round shoes at my house. And how could I resist them at $3 each?